You are currently browsing the tag archive for the ‘table’ tag. Multiple day, long distance trips present challenges that a typical day of off-roading rarely do. Many of those challenges deal with decisions of what equipment to bring, what supplies you need and how much room you have to carry them, especially if your trail rig is a CJ or Wrangler type vehicle. Usually for a short two to three day trip, I will leave my off-road trailer at home which leaves me with limited room for excess or unnecessary gear in my Jeep TJ. A table was not a luxury I could afford to carry given the precious little space available for gear and supplies but a table with chairs is not only convenient for eating but also preparing food and clean up. At a recent Jeep Expeditions event at the Mesa, AZ Sportsman’s Warehouse I found the answer to my needs. 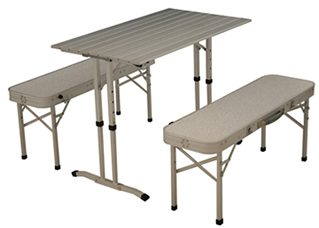 The ALPS Mountaineering Fold Up Table Combo. The set of a table and two benches is made primarily of lightweight aluminum and folds up to about the size of a small croquet set. Something that all of us would be able to easily find room to carry in our Jeeps, find its way to a roof rack, or packed away in your off-road trailer. Set up is a breeze and takes very little time. It stores for transport in a very nice carry bag. Each bench can hold up to two people and we tested the benches out to hold 300+ lbs or more. The size of the table is more than adequate to accommodate four people at dinner, and is perfect for preparing meals and cleanup afterwards.